Despite our warm winter, it was so nice to officially move into Spring. The soil is warming, buds are swelling and lawn mowers are humming on the weekends. I love spring because it is the season where color comes to life again. 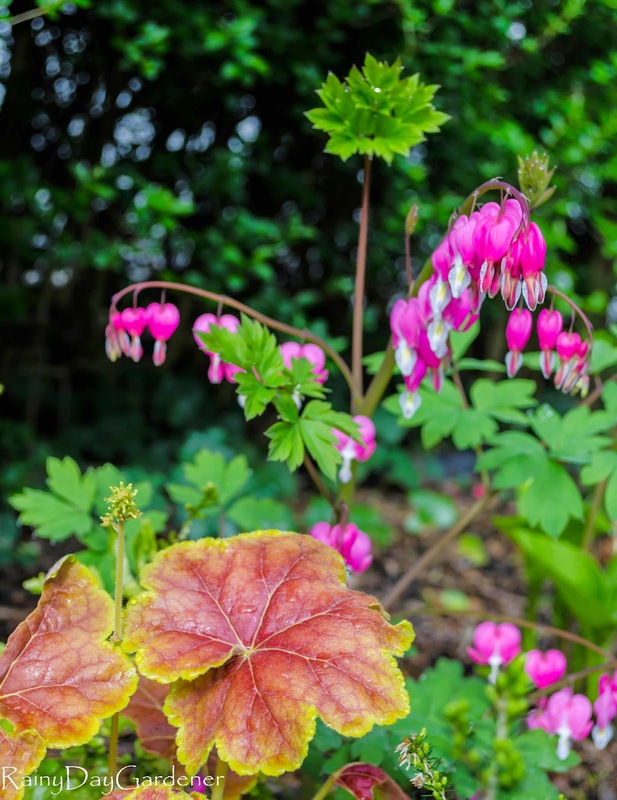 All of my old fashioned bleeding hearts are raising their pink laden stalks and 'miracle' heuchera's foliage is maturing into a striking with salmon pink center with a bright chartreuse edge. This pair really pops out of the flower bed. This clematis has been happily transplanted. The buds are swelling and I am so excited for this plant to have a space to show off later this spring. 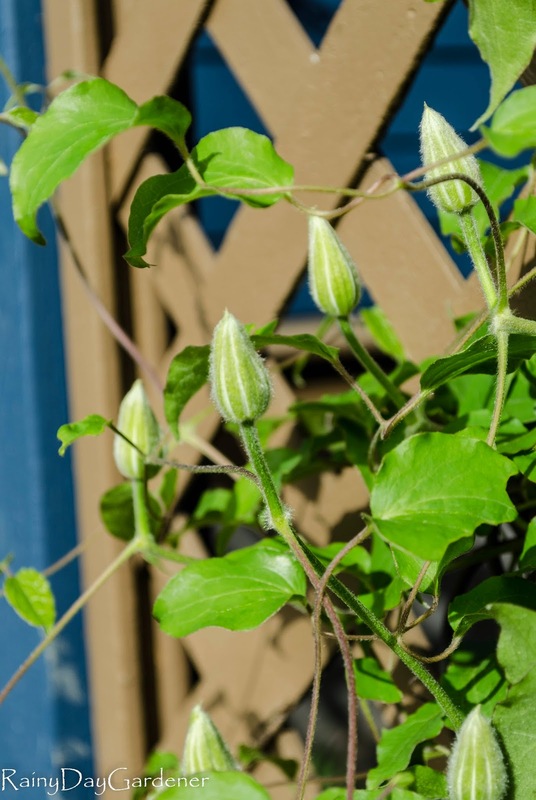 I've paired it with clematis 'Jackmanii', which should bloom later in the season. Now, isn't this a pretty vignette? ?, purples, golds and greens. The hellebores have been central to loving my gardens in the winter months. 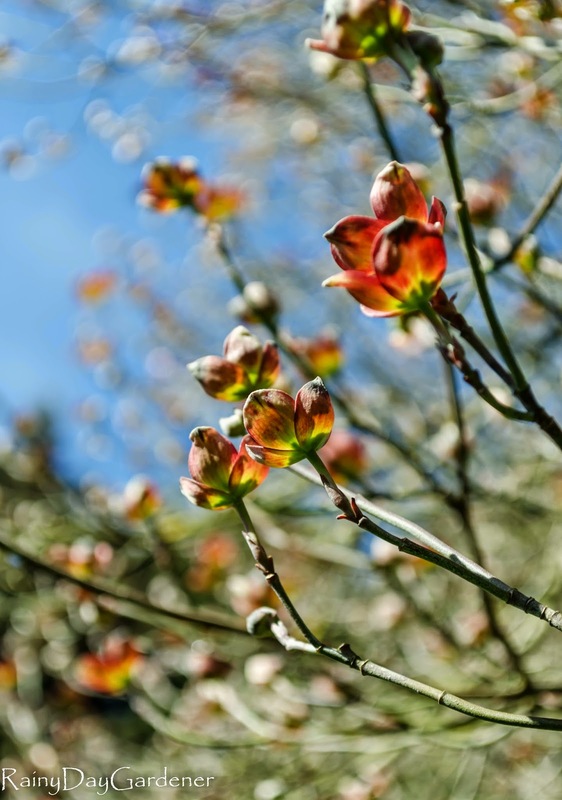 Their blooms hang on into spring and blend beautifully with emerging foliage of ferns and aquilegia. 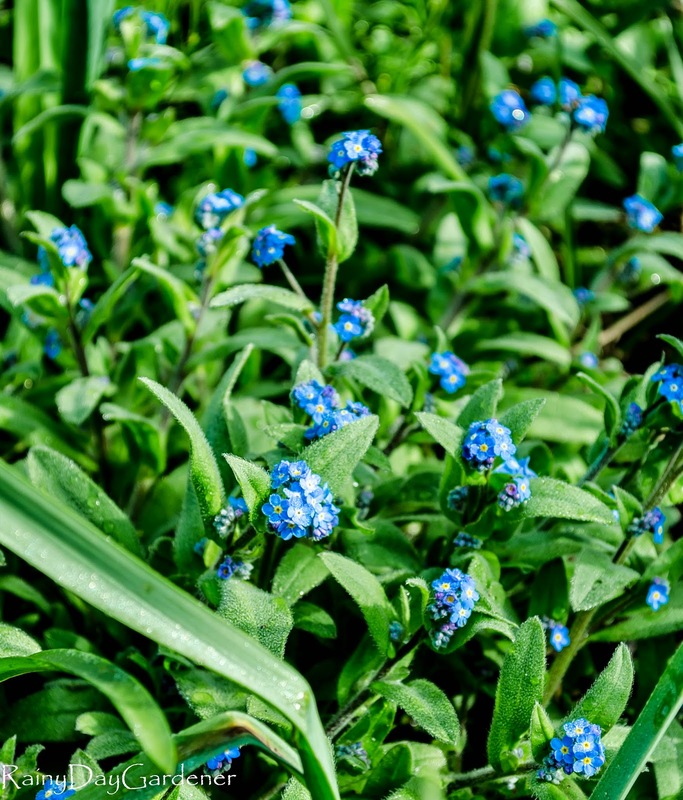 Last year I purchased two Forget-me-Nots and they spread their seeds all over my garden bed....to which I am thrilled. They are currently paired with the inherited spanish bluebells and I have given up on the idea of removing those buggers. Just can't seem to get rid of them. 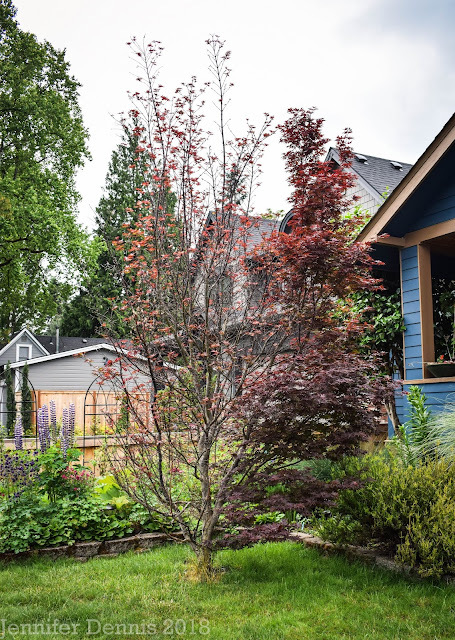 Above is a newer pairing of Coprosma 'Tequila Sunrise' and in the background Abies nordmanniana 'Golden Spreader'. I'm going to be very curious to see how these two plants work out. Ribes sanguineum 'King Edward VII', flowering currant sits on a border in between green panda bamboo clumps. 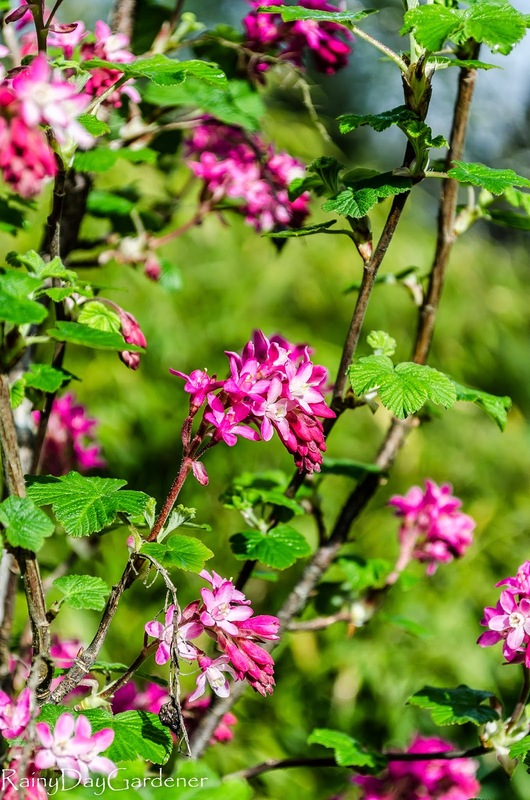 I'd like to get more flowering currant, it is so beautiful in bloom and the hummingbirds really enjoy it. 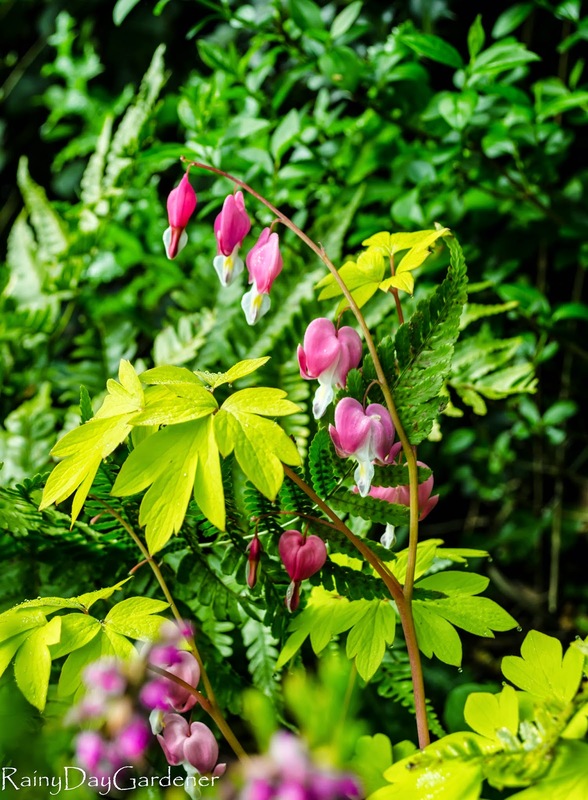 I think I held true to my goal last year of adding more Dicentra spectabilis to my gardens. Here is 'Gold Heart' The foliage is amazing. It really stands out in a sea of spring greens. And finally, this pairing is simply the emerging dogwood's blossoms against a perfect spring sky. Love the spring colors, Jennifer! So lovely…your garden is looking great. 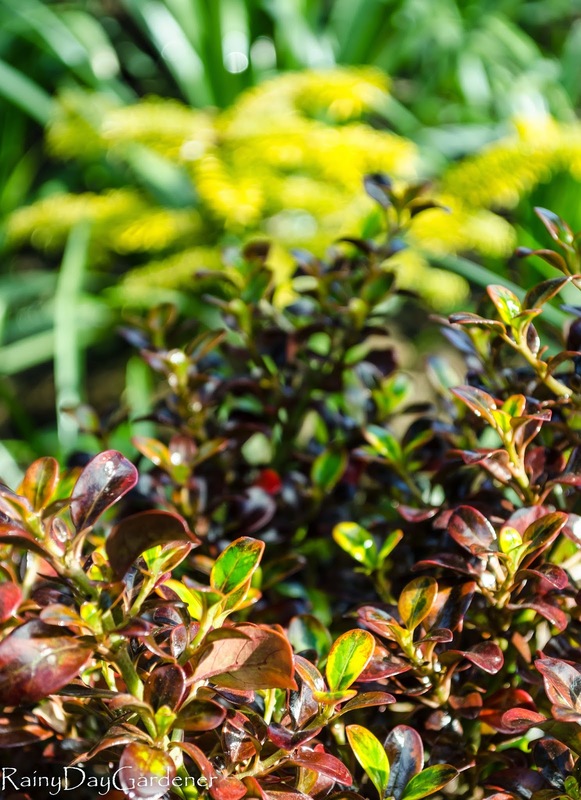 Your Ribes is a nice variety too….I bet you get a lot of hummingbirds! Getting the right combinations is a challenge you have obviously mastered. You have some beautiful vignettes in your garden. That's one of the things I love about gardening, experimenting to see what looks good together. 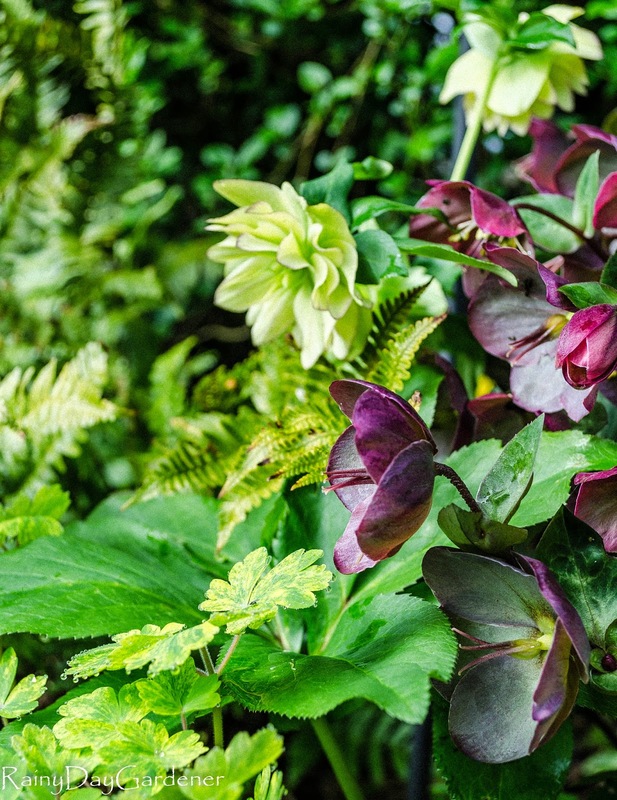 That Hellebore "Dark Lady" is just my sort of thing! We could do with a bit more sunshine to bring things on a bit. We are currently struggling with a period of prolonged strong (damaging) winds. Your spring is earlier than ours, I see. The bleeding heart already in full bloom, fat Clematis buds and last but not least the Ribes sang. 'King Edward VII of which I love the smell on a rainy day. Gorgeous!! You are so very far ahead of us! I have Leprechaun's Gold columbine with hellebores, too. Love that cool foliage. :o) That ribes is incredible. I need to keep an eye out for that one. Ah, the beautiful colors of spring! You've captured them well in your photos! My garden is also full of those crazy Spanish bluebells. Seems like every time I dig them up, more come in to take their place.